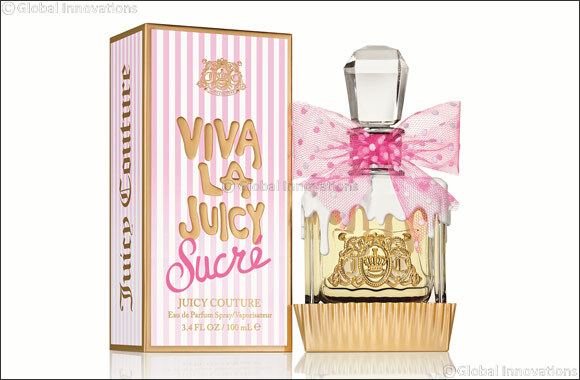 Dubai, UAE, March 8, 2017: Iconic LA fashion brand, Juicy Couture invites the vivacious Viva girl who always lives in the moment to give into the most indulgent temptations with Viva la Juicy Sucré. Playful and positively delicious, this fragrance will inspire Viva girls around the world to celebrate the sweet side of life! In 2008, Viva la Juicy took the fragrance world by storm with its larger than life scent for the girl who embodies luxury, glamour and couture. Embracing the exuberant and trendy lifestyle of the brand’s Los Angeles heritage, the scent became an instant classic in Juicy Couture’s now-extensive fragrance portfolio. Now, the Viva girl gets the chance to indulge her sweet tooth through Viva la Juicy Sucré — a scent as delightful and decadent as a Parisian patisserie. The scent opens with the fresh fruity notes of sparkling Mandarin and juicy Red Currant, with Brazilian Gardenia lending a pillow of softness to the concoction’s feminine edge. At the heart, Orange Flower and Jasmine Sambac blossom into a delectable bouquet drizzled with Peach Nectar and finished with Almond Cream – perfect for a scent as sweet as a Parisian macaron. The base notes of Vanilla Extract and Sandalwood douse the fragrance in creamy warmth, topped with crushed Cocoa Beans to exude one last touch of temptation. The Viva la Juicy Sucré muse is international beauty icon and supermodel, Candice Swanepoel. She perfectly embodies this delightfully mischievous girl who is always the life of the party and lives her life as a treat. With her ability to transform any moment into an adventure, Candice brings the campaign to life with her fun-loving energy and her sensual, elegant presence. She is the epitome of the Sucré girl with her sweet spirit and modern feminine edge, encouraging everyone to celebrate life and #EatDessertFirst. Viva la Juicy Sucré dips the classic into frosted fun topped with fresh femininity. This delicate design shines in a gold cupcake-inspired base with a creamy frosting finish, transforming the iconic Viva la Juicy bottle into an irresistible dessert. A playful pink, polka-dotted bow adorns the collar as a nod to the indulgent, delectable fragrance within.